Rated at 80lbs this is great for backyard fun or Small Varmint Hunting. Bolts fired travel up to 60 fps+ with pinpoint accuracy up to 30 metres. These cross bows give its users far more power and accuracy than a traditional bow. Rated at 80lbs this is great for backyard fun or Small Varmint Hunting. Bolts fired travel up to 300 fps+ with pinpoint accuracy up to 45 metres. 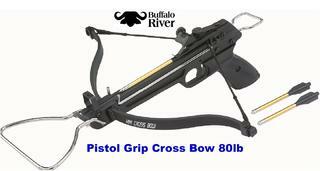 These cross bows give its users far more power and accuracy than a traditional bow. 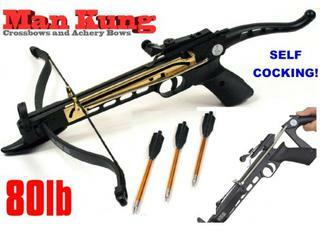 This bow is the more heavy duty / powerful version of our 50lb pistol crossbow. Increased speed and accuracy make this bow the better choice.